Almost everyone who tastes pizza likes pizza and Queen Margherita was no different, right? Well, there may be some truth to that and maybe not. Pizza’s origins reach much farther back in history than Italy and the Queen’s involvement in the popularization of this now globally-known deliciousness on flatbread has roots more in legend than fact. Born in Turin on November 20, 1851, Margherita of Savoy was the granddaughter of King Carlo Alberto of Piedmont-Sardinia. He introduced constitutional monarchy to the Italian peninsula. She was immersed in the history of her royal line and her duty to it from an early age. When she married her first cousin, Crown Prince Umberto on April 21, 1868, she was guided by her sense of duty and not love. Umberto did not love her, either. 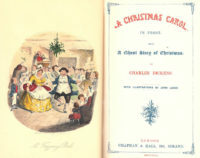 But, the union did produce one heir and the pair complemented each other well and Margherita was able to use her charm and social savvy to win over the rich as well as commoners. When Umberto became king in 1878, Italy was already a united country but there was a lingering animosity, especially because Rome was chosen as the capital. It was Queen Margherita who was the unifier, never uttering a divisive word and showing support for all the people of Italy. This is where fact and legend merge. Pizza, thought to perhaps have origins in the Latin word for flatbread, pinsa, has been part of the human diet since the Bronze Age, as a recent excavation in the Veneto region has borne out. (History of Pizza) Flatbread topped with oil, herbs, spices, and dates was known to be eaten by the early Greeks. Tomatoes were thought to be poisonous (more about that legend) until the1700s and it wasn’t until the 1800s that they caught on as edible not just ornamental. The legend includes a visit by the royal couple to Naples, the former capital of the Kingdom of the South, in 1889. Queen Margherita was bored with French gourmet food, the traditional royal fare of Europe at the time while staying in Naples’ Capodimonte Palace. She saw many of the local people eating large flatbread and grew curious. The queen found it to be delicious. According to legend, Queen Margherita summoned the most famous pizza-maker in Naples, Raffaele Esposito, to bake a variety of pizzas. Her favorite was the one with tomatoes, mozzarella slices, and basil, which perhaps, was made in her honor and so contained the colors of the Italian flag. According to legend, Esposito named his new pizza after the queen and asked to put the royal seal on his shop. A thank-you note was sent a few days later, complete with royal seal. When the BBC investigated the letter, this is what the reporter found. Yes, Raffaele Esposito received permission to place the royal seal on his shop, but the year was 1871 and the shop sold wine and spirits. Esposito married Maria Giovanna Brandi, the daughter of a famous pizza maker, in 1883. He then opened his own pizza shop, the Pizzeria of the Queen of Italy. The thank-you note contained the ‘signature’ of Camillo Galli, who worked as the queen’s chamberlain in Naples. But, there are no records of a letter from him. There are no orders for payment to Raffaele Esposito. When inspecting the royal seal, it is similar but not the official seal. The seal is also in the wrong place. It is placed at the bottom center of the thank-you note and appears in the upper left corner in official documents. 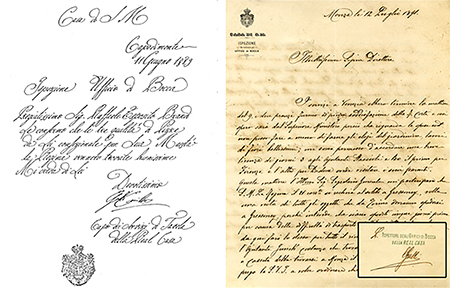 While Camillo Galli did write to Esposito asking for many things including wine, a comparison of that letter and the thank-you note reveal that the two letters were not written by the same hand. “Raffaele Esposito’s pizzeria, the Pizzeria of the Queen of Italy, was eventually purchased by his brother-in-law’s sons, the Brandi brothers. They renamed the pizzeria Pizzeria Brandi and as eminent pizza historian Professor Antonio Mattozzi (himself a scion of a famous Neapolitan pizza family) says, tried to restore it to its former glory with eminent guests. In my mind I see the Brandi brothers sitting down after-hours in their pizzeria in the early 1930s, the world depression weighing heavily on their shoulders. Though the version with Queen Margherita and Raffaele Esposito is the most famous, stories about pizza-eating royals had been circulating since the previous Bourbon kings. The Brandis decide to reshape the legend and link it to their enterprising uncle – it was a credible story since the pizzeria had been called, until recently, “Pizzeria of the Queen of Italy”. One night after serving the last pizza, a friend arrives with a wooden stamp he’s carved to look like the royal crest. Transcriptions of this famous letter, recognising this, often simply leave “Brandi” out, or put it in parentheses, but it is clearly visible in the original. The Brandi brothers, having bought the pizzeria in 1932, had hit upon a clever ploy (the royal thank-you) but there was no obvious relation to the famed pizza-maker, unless he shared their last name. Despite this culinary sleuthing, there is no agreement about the letter’s veracity. There is no doubt, however, by those who eat it that the Pizzeria Brandi pizza is worthy of royal recognition! There is also no doubt that pizza is now a global food. The toppings change based on location, but the basic premise and the name remain the same. 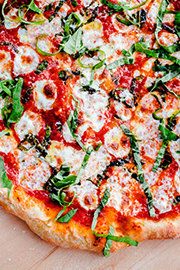 Here’s a recipe for classic Pizza Margherita for you to try. Recollections features history-inspired fashions designed and made in the USA. We love history and hope you enjoyed this post about modern pizza’s connection to the Victorian era. I am a marketing consultant and the marketing director for Recollections, a historic fashion design house in Hawks, Michigan. I write blogs under my name and Recollections. I've always loved history. Now I have an opportunity to write about it and the fashions that defined different historical eras.